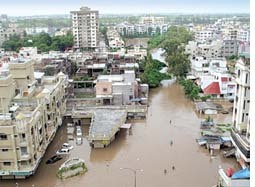 The floods of August 2006 are among the worst Gujarat's Surat city has experienced in recent times. The sudden release of a huge amount of water from the Ukai dam led to over 80 per cent of Surat going under water. More than 2 million people were incommunicado--trapped in their houses without food and drinking water for four days and four nights. While the state government described the floods as a natural disaster, experts had a different version. They claimed the state government was responsible and set up two people's committees after the flood to examine the situation. Both--the People's Committee on Gujarat Floods of August 2006 and Surat Citizens' Council Trust's Committee--have released their reports, indicting the government. The former was set up by two ngos, Narmada Abhiyan and Gujarat Sarvodaya Mandal, with a former acting chief justice of the Gujarat High Court R A Mehta as chairperson.The latter had nine members, including engineers, architects and social scientists. According to the report of the people's committee, released this July, the flood was largely caused by gross mismanagement of Ukai dam operations and could have been averted, or minimised, if the authorities had taken note of the signs of an approaching flood and released water from the dam promptly. "The water level in the reservoir had already crossed the prescribed rule level of 333.60 ft in the morning of 3rd August...and [the] water level in the reservoir was raised up to 335.5 ft by the end of 5th August, which was 1.5 ft higher than the prescribed rule level of 334 ft for the day. Thereafter too, the water level in the reservoir was continuously raised and brought up to 337 ft by the end of 6th August and then up to 339.5 ft. by 8-00 am in the morning of 7th August ... By that time the reservoir was already 90 per cent full with very little empty space (flood cushion) left for storing additional water. And the inflow was still increasing...The outflow was then sharply increased in a short span of a few hours from 5 lakh [500,000] cusecs at 9-00 am to...8 lakh [800,000] cusecs by 3 pm in the afternoon [of August 7, 2006]. The outflow was then increased further to the peak of about 9 lakh [900,000] cusecs at 11 am on 8th August and kept at that level up to 8-00 am on 9th August," reads the people's committee report. The committee, in its report, also said that the state government had worked against the forecast of the Central Water Commission. The district collector and the municipal commissioner had sounded the alarm bells, but were ignored. The Surat citizens' committee has also found mismanagement of the Ukai dam waters, from data obtained under the Right to Information Act, 2005. "The root cause of such flooding is faulty urban development practices. City development plans have failed to study rivers as an integral part of a city's drainage network. Hence flood plains have been consumed for development. Surat has a history of floods, which have grown as the city has expanded and eaten into the course of Tapi river," says Biswaroop Das, a committee member and urban development expert. Other experts, too, are saying that the floods were clearly human-made. "The state government could have easily averted the crisis. In 1998, Surat was flooded and some measures were suggested to the state government, none of which have been followed. There is a need to make embankments at the Ukai dam. Also the banks of the Tapi river are illegally encroached by industries, housing colonies and buildings, reducing its carrying capacity from 900,000 cusecs to less than 600,000 cusecs. They need to be removed," says Satyakam Joshi of the Surat-based Centre for Social Studies. The state government has set up a two-member commission to enquire into the floods but it has not submitted a conclusive report yet. "The government is delaying functioning of the commission because state elections are approaching and a negative report will work against it," says Joshi. Das says urban planning needs to be revised, given that no city can withstand three days of continuous rainfall.